Janet Renee has over a decade of experience as a registered dietitian. Renee attended the University of California, Berkeley and holds an M.S. in Nutrition and Dietetics. Coconut is a popular food these days, which has resulted in an abundance of different coconut products becoming available in supermarkets. Two of the most commonly used products are coconut oil and coconut milk. Coconut oil is a versatile cooking oil, while coconut milk supplies fat, protein and various nutrients. Coconut oil is a fat made from pressed coconut meat. Coconut cream is made from coconut meat that has been heated in water. Diluted coconut cream is used to make most coconut milk products. Read more: Do These 11 So-Called Superfoods Live Up to the Hype? Coconut oil can be used to cook with; you can make virtually any dish, from baked goods to fried foods, with this oil. You can also use it to make salad dressings or even beverages, like smoothies. There are different types of coconut oil, which means that in the supermarket, you'll often see products with labeling differences. For example, products may have words like refined, hydrogenated or virgin on their labels or may not be labeled at all. Make sure to stay away from hydrogenated coconut oil, which typically contains unhealthy trans fats, and always purchase virgin coconut oil when possible. Virgin coconut oil is made by pressing fresh coconut meat, while refined coconut oil is made by pressing dried coconut meat. Every tablespoon (14 grams) of coconut oil has 13.5 grams of fat. The fats in coconut oil are a mixture of polyunsaturated, monounsaturated and saturated fats. Coconut oil doesn't really have any other nutritive value otherwise, though it is known for being rich in antioxidants of various types. Although coconut oil can be used in a variety of foods and is generally considered to be a healthy fat, it should be consumed in limited amounts. This is because most of its fats are saturated, and the American Heart Association considers excessive consumption of saturated fats to be bad for you. There are lots of different types of coconut milk, so this product can differ substantially in its nutrition. It's possible to make coconut milk from young coconuts, which are low in fat, or older coconuts, which can produce a fattier product. 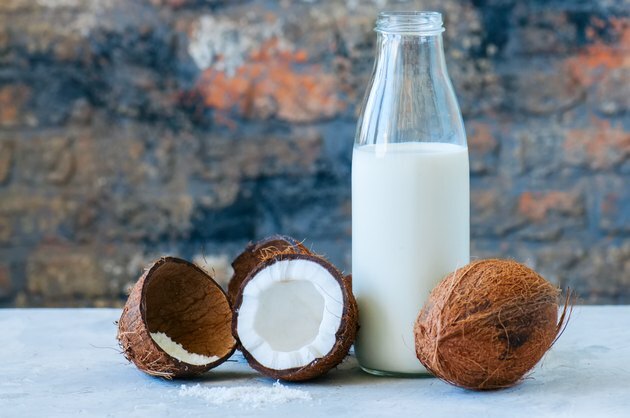 You can easily find coconut milk products that have the consistency of any other milk product — from skim milk to full-fat milk. Most commercial products are made from older, fattier coconuts and watered down. However, it is possible to make your own coconut milk at home if you have access to fresh, raw coconut meat. Coconut milk also contains small amounts (between 1 and 4 percent) of other nutrients like calcium, vitamin C, B-complex vitamins and choline. You can obtain 2 grams of protein, 21.3 grams of fat and 2.8 grams of carbohydrates in every 100 grams of coconut milk. According to the Food and Drug Administration, you shouldn't consume more than 20 grams of saturated fat each day, so 100 grams of coconut milk is about the maximum amount of this food that you should have on a daily basis. Be cautious of consuming many refrigerated coconut milk products, as they typically contain a lot of additives, like added sugar and may have very little actual coconut. Products like these might be fortified with additional nutrients but may not be very healthy compared to other plant-based milk products. Coconut milk and coconut oil are both made from coconut meat. Coconut milk is made by heating the coconut meat in water and filtering the resulting product, just like coconut cream. In contrast, coconut oil is made by pressing the meat to extract its fats. This means that the difference between coconut oil and coconut milk is primarily a function of the processing method. Coconut milk is a nutrient-rich food you can consume somewhat liberally, although limited by its fat content. In contrast, coconut oil is a high-fat product that lacks the nutrients other coconut products have and should typically be consumed in moderation. From a nutritional perspective, coconut milk is usually better than coconut oil. However, it's actually coconut oil that has been associated with the most health benefits and causes the most controversy. If you're very fond of coconut and want to consume it regularly, alternate the products you're consuming to obtain the full benefits of coconut. Other coconut products, like raw coconut meat, have even more vitamins, minerals and other important nutrients, like fiber. Since coconut milk and cream are made using the same process, differentiating coconut cream versus coconut milk can be challenging. Unlike coconut oil and milk, coconut cream and milk can have a lot of similarities. The differences between these products depend entirely on the manufacturers and how much coconut they incorporate into a product. Coconut milk typically has the consistency of any other milk, which means it can resemble soy milk, almond milk or animal milk. Coconut cream is simply a bit thicker, like soy cream, oat cream or any animal cream product. The primary difference between coconut milk and coconut cream is that coconut cream has more coconut and less water. Although this sounds straightforward, coconut milk products can vary substantially. The coconut milk you find sold in cartons is likely very similar to low-fat milk in consistency. However, coconut milk is often also sold in cans. Canned coconut milk is usually creamier and contains a lot more coconut than other milks, to the point that it may even be equivalent to coconut creams. Coconut milk in cans can have variable amounts of coconut: Low values around 25 percent are common, but you can find values as high as 65 percent. Coconut creams always have a lot of coconut — but this value may also be around 65 percent, which is why there's some overlap between these products. Some coconut creams contain shredded coconut or are more similar to solidified oil, but most are simply a fattier, creamier version of coconut milk. Read more: 18 Fat-Rich Foods That Are Good for You. What Are the Benefits of Creamed Coconut? Can You Boil Coconut Milk for a Steamer Drink?